Marie Ann Feuerstein, 94, Algoma, died peacefully at home, Tuesday July 10, 2018. Marie was born in Forestville on March 22, 1924 to Lawrence and Theresa Schlise. She married Leonard Feuerstein on November 6, 1948 in Maplewood and was blessed with nine children. She later became a member of St. Mary Catholic Church and the Rosary Society. Marie enjoyed spending time with her children, grandchildren and great grandchildren. She was a member of the "Grapes", a group of ladies that met regularly since high school. She also enjoyed the annual summer family fun day and the Tours for Women trips planned by her daughters. Marie graduated from Algoma High School and attended the Door/Kewaunee Normal School. She taught for several years in a one room schoolhouse and then took time off to raise her family. 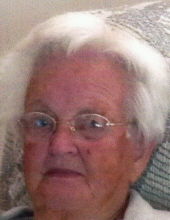 In 1971 she became a teacher's aide at the Algoma Elementary School and worked there for 18 years. She is survived by her three sons; James (Kathy) Feuerstein, Merrill; Larry Feuerstein, Algoma; and Lee (Kathie) Feuerstein, Green Bay; six daughters; Carol Kittell, Green Bay; Jane Feuerstein, Algoma; Mary Ross, Algoma; Ann Feuerstein, Green Bay; Linda (Pat) Schley, Sturgeon Bay and Dawn (Randy) Neubauer, Two Rivers; 11 grandchildren, eight great-grandchildren. She is also survived by brother John (Marge) Schlise, sister-in-law Janice Schlise, brother-in-law Eugene (Marion) Feuerstein and many nieces and nephews. She was preceded in death by her parents, husband, sister and brother-in-law Helen (Al) Vlies, brother Robert "Scoop" Schlise, brother-in-law Joseph Feuerstein, sister-in-law and brother-in-law Colette (George) Winnekins, son-in-law Jon Ross and nephew Butch Vlies. Family and friends may attend a visitation, Thursday, July 12, 2018 at the SCHINDERLE FUNERAL HOME, Algoma, from 4 PM until the time of the Prayer service at 7 PM with Rev. Alvan Amadi. Visitation will continue Friday, July 13, 2018 from 9:30 AM until the Mass of Christian Burial at 11 AM at St. Mary Catholic Church with Rev. Alvan Amadi officiating. Entombment at the Shrine of the Good Shepherd Mausoleum. In lieu of flowers, memorials may be made to the charity of your choice in memory of Marie. The Feuerstein family would like to express their appreciation to Unity Hospice staff for all their wonderful care and compassion. To send flowers or a remembrance gift to the family of Marie Ann Feuerstein, please visit our Tribute Store. "Email Address" would like to share the life celebration of Marie Ann Feuerstein. Click on the "link" to go to share a favorite memory or leave a condolence message for the family.